I'm not sure that these flowers are specifially Bruges. They don't match other motifs in books that I have. But I post the link here because the 2 flowers show interesting ways of decorating the outer part of the petals. A new book on Bruges bloomwork in Spanish. Haven't seen the inside. Método teórico - Práctico de la técnica del encaje de Brujas, manual de consulta y ayuda con un patrón tradicional Belga. Thank you. I will certainly write if I discover anything. I don't know enough to actually help you in your search for information. The problem is that many new laces, and new simpler versions of old laces, were invented in the early 20th century (and late 19th century). Bruges Bloomwork was invented in the early 20th century, but I have not been able to find any more specific information about just who started it. It may have been one of the teaching centers, or perhaps an individual. Chrysantenwerk is supposedly a branch of Chrystantenwork. So it should have started at about that same time. It is very frustrating. I have wanted clarification on this myself. One possibility is that Kantcentrum (the old Kantcentrum) may have been involved. I will be interested to hear anything that you may discover about this issue. Thank you for all your informations and links. I'm more interested in history of it than in chrysantwerk technik itself. I've allready ordered 2 books about it and hoped that they include also something about history. In first one (Belleville: Chrysanthemum Lace) there was nothing, I'm still waiting for second one (Cockuyt: The technique of chrysanthemumbloemwork). 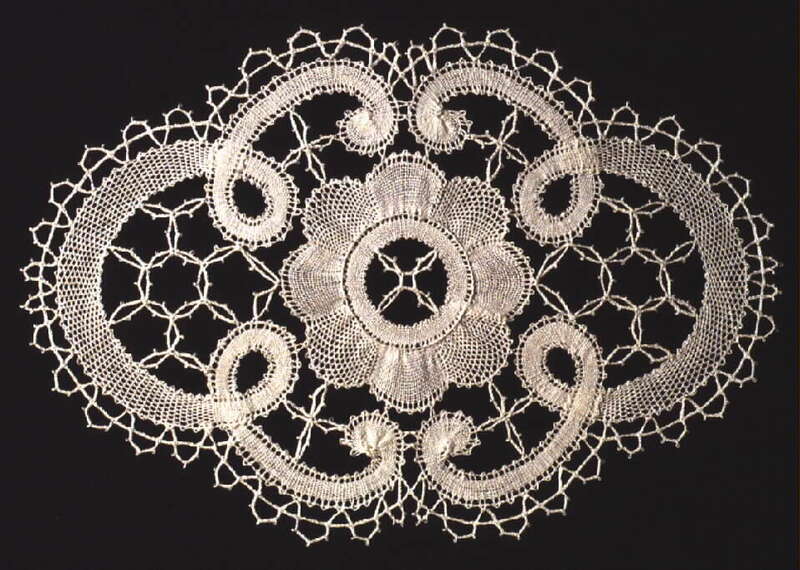 I would be very happy if someone has old patterns for chrysanthemum lace. That piece was given to me by my teacher, who lived in Iowa. She said that someone she knew had made it. 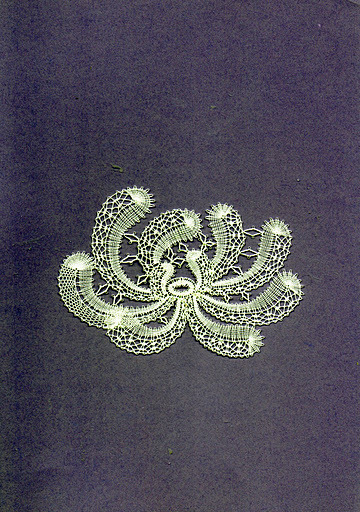 I have seen several photographs of similar laces in various places. But I don'[t remember exactly where. My impression is that the piece is from a 20th century pattern designed in the tradition of "Chrysanthemum Work". She told me that Chrysanthemum work is a subdivision of Bruges Bloomwork (also a 20th century invention, or perhaps very late 19th century). 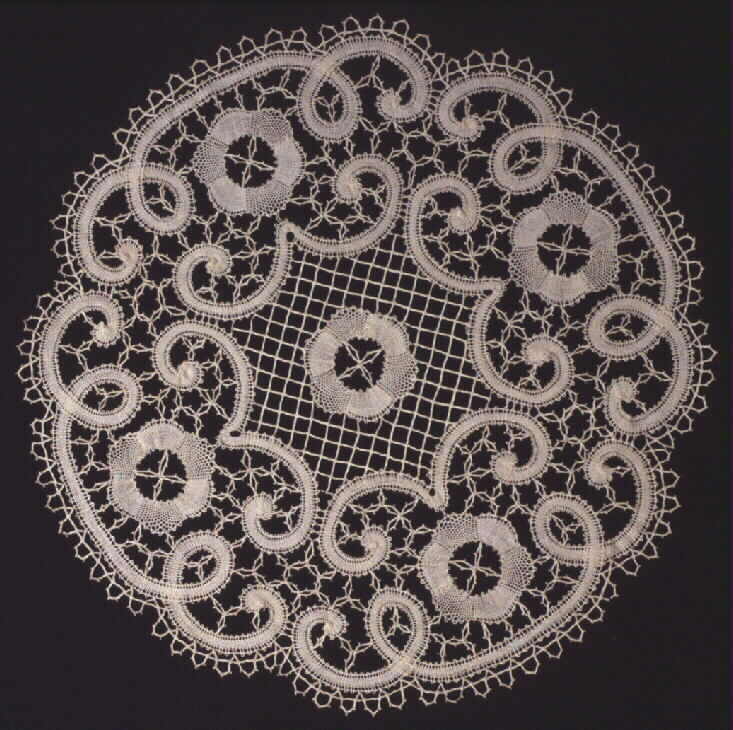 LOKK (the Dutch lace guild) has a simple free pattern on their website. Hello. 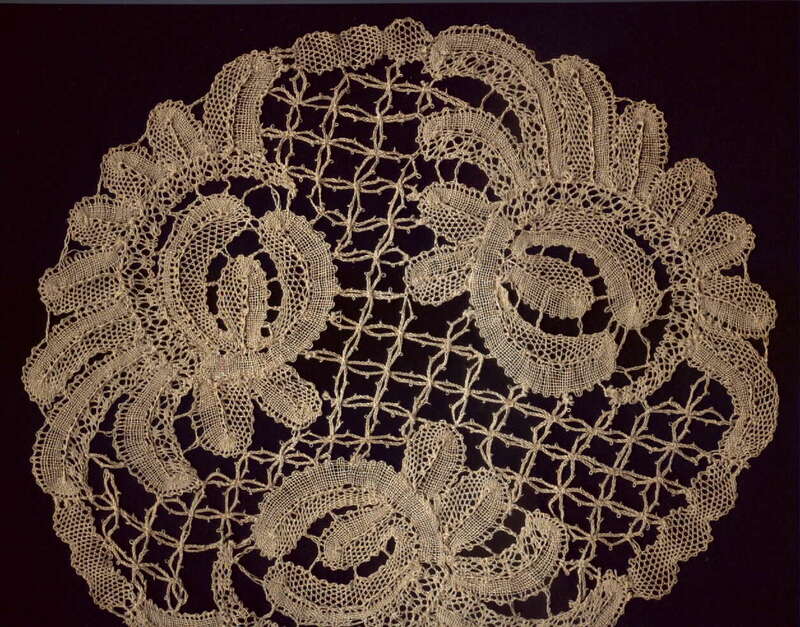 I'm interested in lace on photo in "Examples and resources" - chrysanthemum work, first example (http://lynxlace.com/images/lace435.jpg). Do you know where is it from, how old it is, who and where made it, anything ... 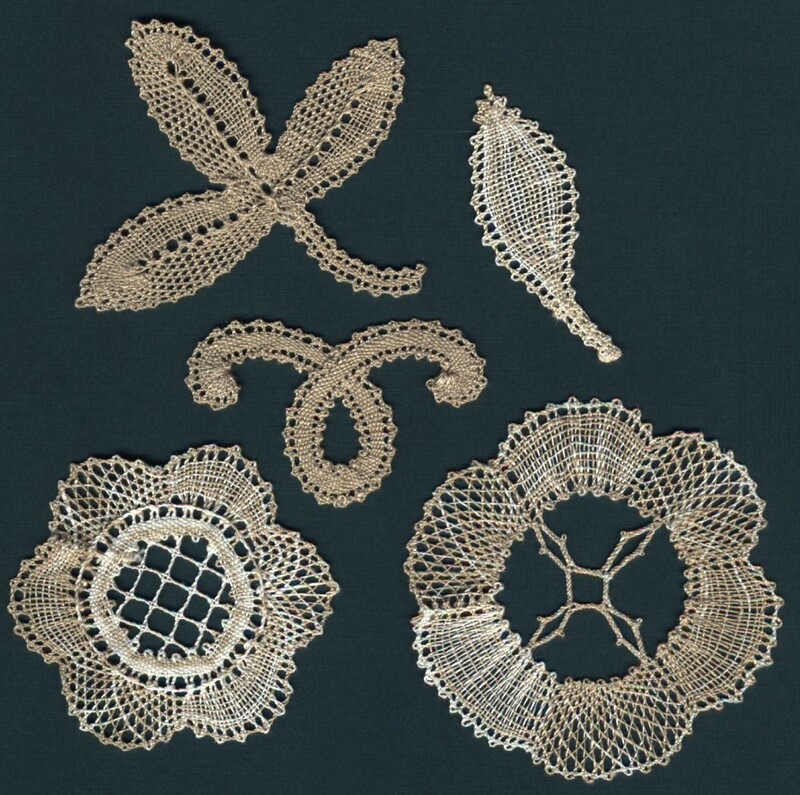 I research bobbin lace patterns with chrysanthemum motif. In Slovenia it was quite popular in 20's and 30's, but tecnik that was used, was broad tape and sometimes halfstitch. 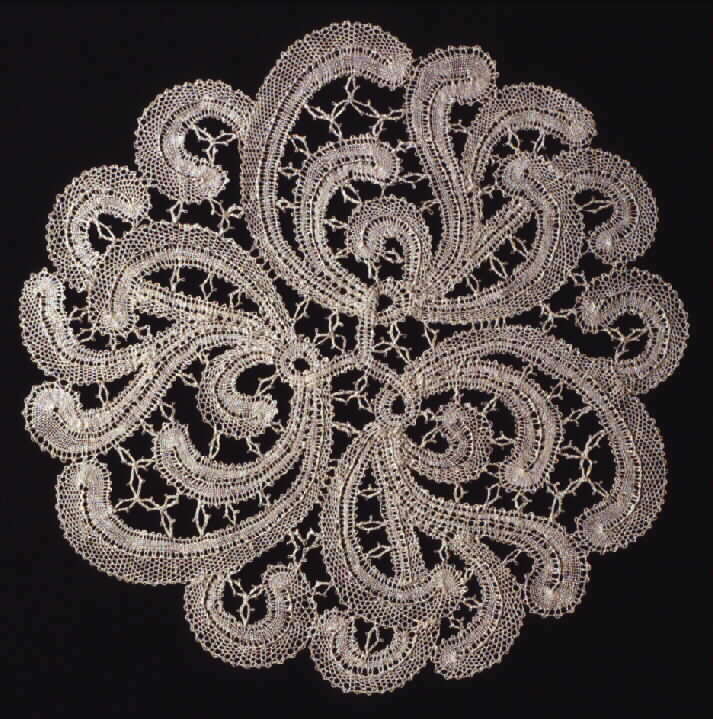 Anyway, a pattern used for the lace on photo could be the same for bruges and "slovenian" type of chrysanthemum. I am very interested in history and possible connections between both. So, please, I would be very grateful for any information. "Afrodita Hebar Kljun It is pattern of Slovene pattern designer Irma Pervanja, you can find it here: http://merletti.si/.../vecj.../948-402001-prticek-30-cm.html.